Updated at 7 p.m. EDT (2300 GMT). Hurricane Matthew slammed NASA’s Kennedy Space Center, home to multiple launch pads and spacecraft assembly facilities, with wind gusts of more than 100 mph early Friday, but there were no immediate reports of significant damage at the spaceport as officials assessed the storm’s impact on upcoming launches. The hurricane made its closest approach 25 miles east of Cape Canaveral around 6 a.m. EDT (1000 GMT) at a Category 3 storm, packing maximum sustained winds of 120 mph. 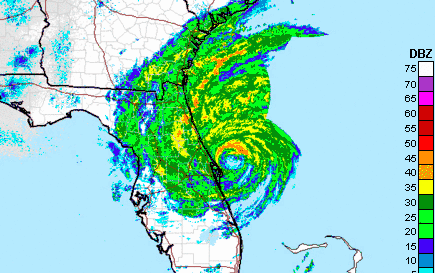 Radar imagery showed the western eye wall, containing some of Hurricane Matthew’s strongest winds, passed over the eastern tip of Cape Canaveral before moving north, paralleling Florida’s Atlantic coast. “The wind is starting to decline but remains near tropical storm strength,” said George Diller, a NASA spokesperson who rode out the storm with emergency crews at KSC’s Launch Control Center, which used to manage space shuttle countdowns. While a thorough assessment of conditions across the center will not begin until winds die down Friday afternoon or Saturday morning, Diller said there were no obvious signs of significant damage. But the threat from storm surge, which was forecast to inundate low-lying parts of the space center with up to 9 feet of water, appeared to have diminished after KSC avoided a direct hit. Updated predictions just before Matthew passed by Cape Canaveral indicated the storm surge would raise the ocean level by 1 to 5 feet, with 8 to 12 inches of rainfall expected. “Storm surge has been observed to be relatively minimal, limited to localized portions of the space center,” Diller said. An update posted on NASA’s website Friday afternoon indicated the hurricane caused widespread, but relatively minor damage. According to NASA, Cape Canaveral had top sustained winds of 90 mph, with a gust to 107 mph. Diller told Spaceflight Now a weather station at the 492-foot-level at KSC clocked a gust to 132 mph. When Hurricane Frances battered the space center in 2004, a sensor in the same location detected a gust to 102 mph. 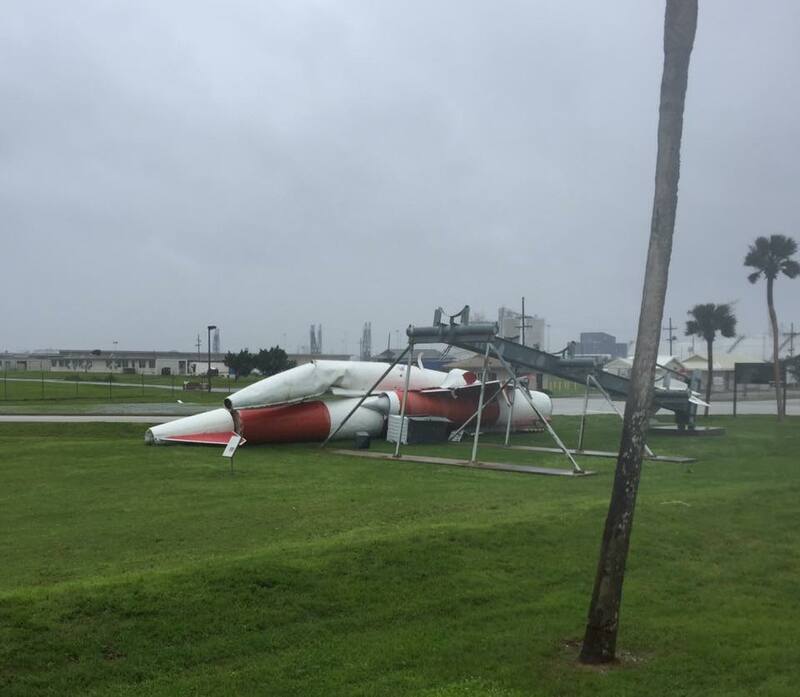 Military officials in charge of Cape Canaveral Air Force Station reported minor damage there. 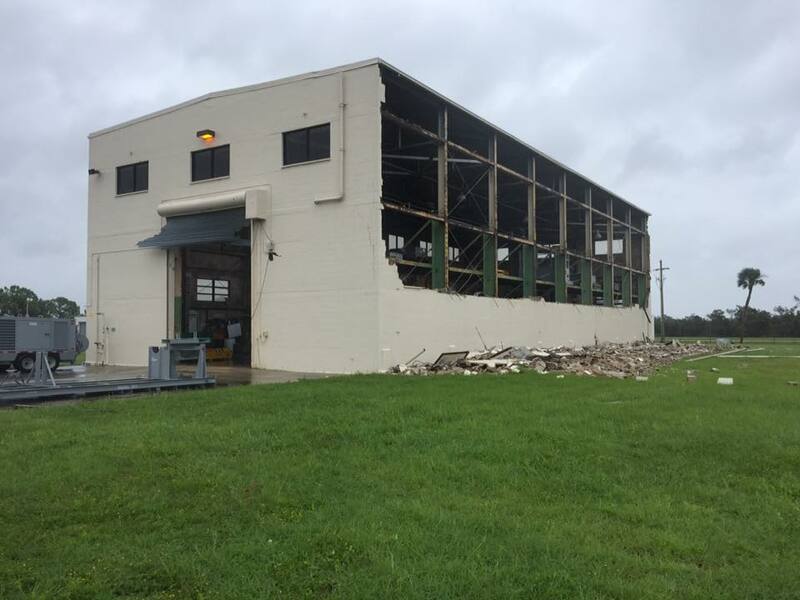 Images posted on the 45th Space Wing’s Facebook page showed a collapsed wall on a building at the southern edge of the Air Force station, and roof damage on a structure in the base’s industrial area. “We are still experiencing deficiencies in critical infrastructure, consistent power, emergency services, communications and hazardous material inspections that make portions of our base uninhabitable or potentially dangerous,” Monteith wrote. Images on social media also showed a Cold War-era Navaho missile, the last of its kind, crumpled after it fell off a display just outside the south gate to the Air Force station. KSC and Cape Canaveral Air Force Station remain closed to non-emergency personnel. By Friday afternoon, Florida transportation officials re-opened most causeways leading to the barrier islands in Brevard County, where KSC is located, after authorities completed bridge inspections. Two satellites awaiting launch at Cape Canaveral were protected from Category 4 hurricane-force winds, including a new NOAA weather observatory that was set for liftoff atop a United Launch Alliance Atlas 5 rocket Nov. 4 on a mission to drastically improve hurricane forecasting. NOAA’s GOES-R weather satellite is housed inside a clean room at the commercial Astrotech spacecraft processing facility on the mainland in Titusville, Florida, just west of Kennedy Space Center. Technicians earlier this week planned to construct a tent over the satellite to further protect it from water intrusion. GOES-R is the next satellite scheduled for launch from Cape Canaveral, but ULA said preliminary information indicated the liftoff could be delayed a few days later than Nov. 4 after this week’s weather delayed launch preparations. An Air Force missile warning satellite, named SBIRS GEO Flight 3, rode out Hurricane Matthew in a clean room at Cape Canaveral Air Force Station, and military officials said the spacecraft was secured for the approach of the storm. Other high-profile facilities at the spaceport include the 525-foot-tall Vehicle Assembly Building, now being outfitted to stack NASA’s towering Space Launch System, a huge rocket for deep space missions scheduled for a debut test flight in late 2018. The 400-foot-tall mobile launch platform intended for the SLS is parked just outside the VAB. 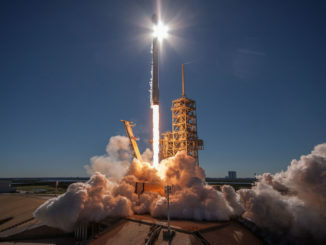 There are no rockets standing on any launch pads at Cape Canaveral, which has three active launch facilities and several more being reworked for future missions, all within a few hundred yards of the beach. ULA operates Complex 41 and Complex 37 for its Atlas 5 and Delta 4 boosters. 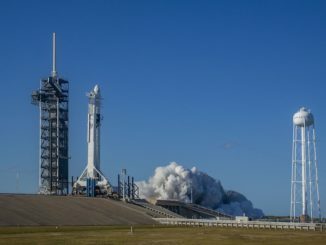 SpaceX’s primary Falcon 9 launch pad — Complex 40 — is temporarily out of commission after a rocket exploded during a ground test Sept. 1. 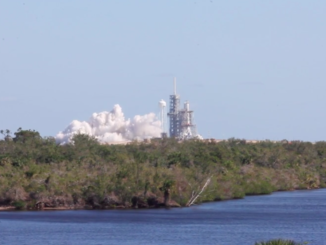 SpaceX leases the shuttle-era pad 39A from NASA, and the company is completing modifications to that facility to ready it for Falcon 9 launches while nearby Complex 40 is repaired. Before Hurricane Matthew’s brush by the Space Coast, SpaceX aimed to have pad 39A operational by November.